When it comes to outfitting an outdoor space, hot tubs are must-haves for many homeowners. Adding a hot tub to your deck, however, requires careful planning. You need to consider everything from ensuring adequate structural support to determining the optimal location for the tub to understanding electrical requirements. We have collected some great tips and advice from deckmagazine.com and other online sources. Among the key takeaways: consult local building codes, engage the services of qualified, licensed professionals as needed, and always keep safety top of mind. 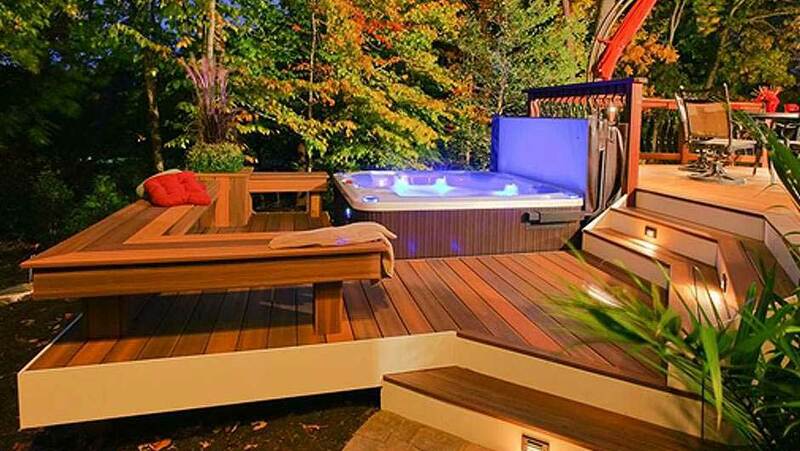 Deck layout or structural decisions should be made after selecting your hot tub or spa, experts suggest. 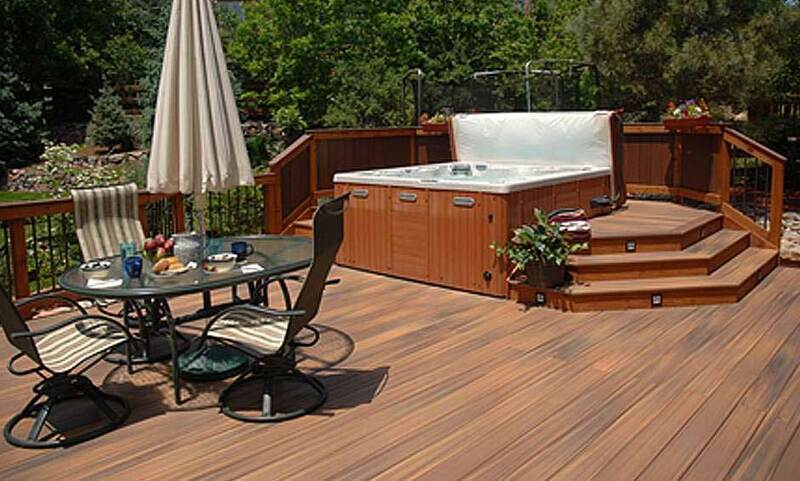 Shown here: Fiberon Composite Decking. First things first: Although people use the terms “hot tub” and “spa” interchangeably, if the unit has circulating jets, the more accurate industry term is “spa.” Either way, experts recommend that you select your hot tub/spa before making any structural or design decisions regarding your deck. As with most big ticket purchases, prices for hot tubs/spas vary widely. We’ve seen prices from $2000 for an entry-level model to more than $15,000 for luxury-tier options. Before you get swayed by features such as colored LED lights, integrated cup holders, and stereo systems, the first item you should look for is something called “full-foam” insulation, experts say. This high-density, closed-cell polyurethane foam fills the space between the spa’s outer cabinet and inner shell, and will reduce heat loss and noise levels as well as increase the stability of the overall unit. Spend some time researching manufacturers online. Visit reputable dealers (experts stress the importance of “buying a dealer” before you buy a spa). Test-drive the tubs. Ideally, grab your swimsuit and climb in for a soak or, at the bare minimum, gather up the family and sit in an empty tub to ensure there’s room for everyone to stretch out and enjoy. Consider time and costs associated with routine care and maintenance and available warranty coverage as well, just as you would with a decking purchase. Remember that delivering and installing these behemoths can be a challenge. Be sure to discuss costs and procedures with both the spa retailer and your deck builder to avoid unpleasant surprises. A flat, level surface such as a concrete slab is the ideal location for a hot tub. If you’re building a new deck, the slab should be formed and poured at the same time as your concrete footings. A 3-1/2 to 4 inch slab is usually sufficient, experts say; however, larger tubs may require something more substantial. A 56-sq ft. hot tub with a dry weight of 855 lbs. can hold 420 gallons of water and seat 6-7 people (average weight per person = 185 lbs.). 855 lb. tub + 3500 lbs. water + 1295 lbs. for 7 occupants = 5655 lbs. total weight. 5655 lbs. divided by 56-sq ft. = 101 lbs. /sq. ft. = design load the framing must be able to support. To size the joists and beams accurately for such a heavy load, most builders will consult a structural engineer or use beam-design charts, calculators, or software packages created for deck builders. If the deck is elevated, an engineered design is usually required by local authorities. Ready to plan your new outdoor oasis? Start designing with the Fiberon Deck Designer tool. Traffic flow, air flow, and space for the cover lift to function are key considerations when determining your spa’s location. 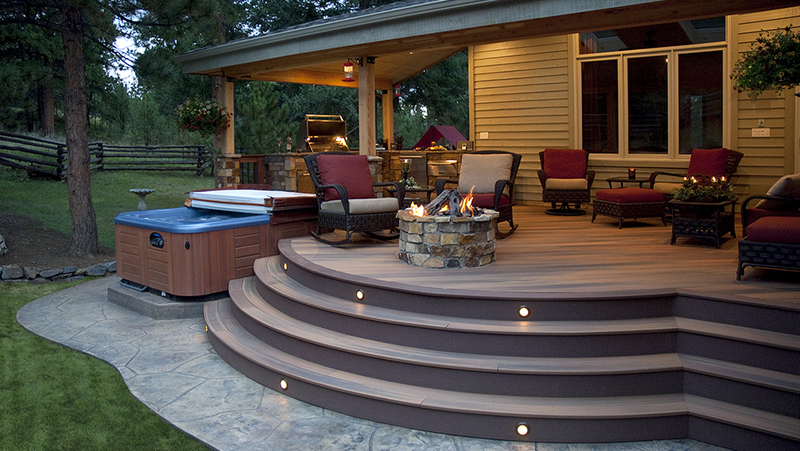 Shown here: Fiberon Horizon Decking. Ensure there is adequate room around the spa for the cover lift to function and air to circulate. On larger decks, consider traffic flow around the space. Take note of prevailing winds. Locating the unit near the corner of the house tends to accentuate the wind, some builders say. Factor in the orientation of the sun and location of trees. Don’t forget about the neighbors. A privacy screen, pergola or other design element will shield your space from the people next door. Orient your spa to maximize backyard scenery, but be sure the unit itself doesn’t interfere with that view when you’re inside looking out. Ensure there is a door nearby (or a well-lit path) for quick dashes indoors on chilly evenings. And if the thought of running barefoot across a splintered wood deck makes your wince, upgrade to low-maintenance, easy-on-your-toes composite decking from Fiberon. It never needs staining, sanding, or refinishing. Unlike wood, Fiberon composite decking won’t rot, splinter, or crack, either. 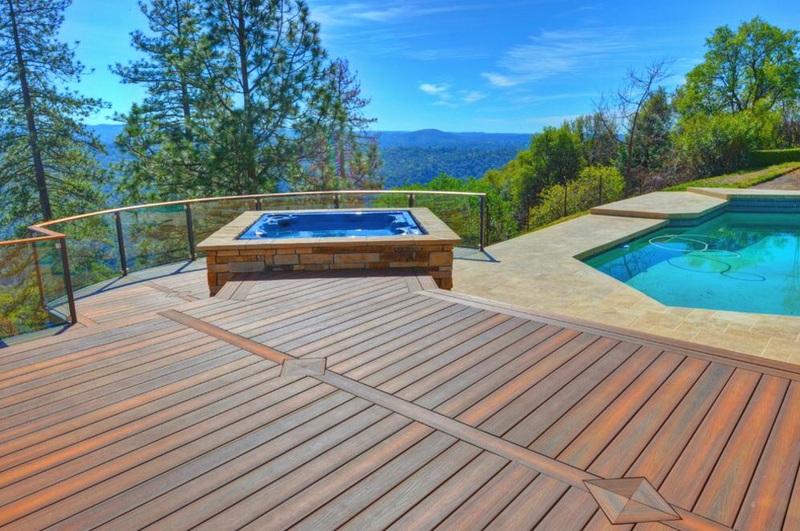 A breathtaking view deserves decking that’s equally breathtaking. 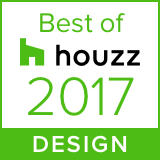 Fiberon Horizon Decking in Ipe emulates the warmth and beauty of exotic hardwoods, and offers lasting durability and 25-year performance warranties. You’ll need a nearby electrical source to power your spa – and a licensed electrical contractor to do the work. Determine whether you or your builder will be responsible for hiring the contractor, obtaining permits, and ensuring all necessary electrical work is completed appropriately. Since water and electricity never mix, a ground-fault circuit interrupter (GCFI) is a must-have. This device will shut down the system immediately if it detects a change in current flow. Some smaller spas can be plugged into a GFCI-protected 110v/20-amp outlet. Larger units usually require a 220v/50-amp connection to work properly. A nearby emergency shut-off (usually within 5-15 feet of the unit) is also required by code. Plus, if your tub will be sitting on a concrete slab, the electrical wiring must be run in conduit and placed before the concrete is poured. Many builders recommend installing the hot tub so that its edge is 17-24 inches above the decking. Guests can sit on the rim and swing around into the water more easily. For spas located on top of a deck, stairs are in order. No doubt you’ve seen spas that are flush with deck surfaces – an elegant look but one that can prove hazardous. Children, in particular, are more likely to step on the cover or even fall into the spa. Of course, if you have children or expect young guests, a cover with a lock – and, of course, vigilant adult supervision -- is essential. A locking cover for your spa and constant adult supervision are essential if you have children or young guests. Shown here: Fiberon Horizon Decking in Ipe. No matter how or where the tub is installed, there must be access to the motor for servicing. Access panels or removable steps are easy solutions for tubs placed on the deck’s surface. If the spa is partially recessed, the experts at deckmagazine.com suggest leaving at least side accessible. For a recessed spa, your builder may opt to frame out an access hatch or otherwise leave room around the tub’s edge so that the unit may be lifted straight up from its space. With careful planning and the help of qualified professionals, a hot tub/spa can be a great addition to your new outdoor space. To learn more about hot tubs – and to download valuable safety information – visit the Association of Pool and Spa Professionals website. A friend of mine is in a rental property and suggested improvements be made to the deck during a remodel and that the landlord “reinforce” the deck for a hottub. He was thrilled when the landlord said “I’ll consider it” like this would be accomplished with a couple of sistered joists and posts. I just scribbled on a napkin that the weight off a filled hottube would be roughly that of a volkswagen golf. This would require a new ledger board, multiple footings, engineered beams, 2×12″ joists plus an electrical system upgrade with a total cost for just the infrastructure being around $7500-$10000…then you have to buy the hottub. him: ” oh…I kind of envisioned these swinging wintertime hottub parties”. me: “buy a house and you’ll learn what things cost”.